The Rio 2016 Olympic and Paralympic Games are nearly underway and for the next few weeks sports fans will be glued to the events. As with all major sporting events so much happens on and off the playing field. When we look back at these events, what do we look at? Archives play an essential role in collecting these snapshots in our lives. As we live in a digital world web archives play a central role in this process. The IIPC Content Development Group curated three large Summer and Winter Olympics collections (2010, 2012 and 2014) and is now archiving the events both on and off the playing field in Rio. Now it’s your opportunity to have your say about what goes into this collection. The IIPC CDG is calling on you to get involved through the public nomination form. 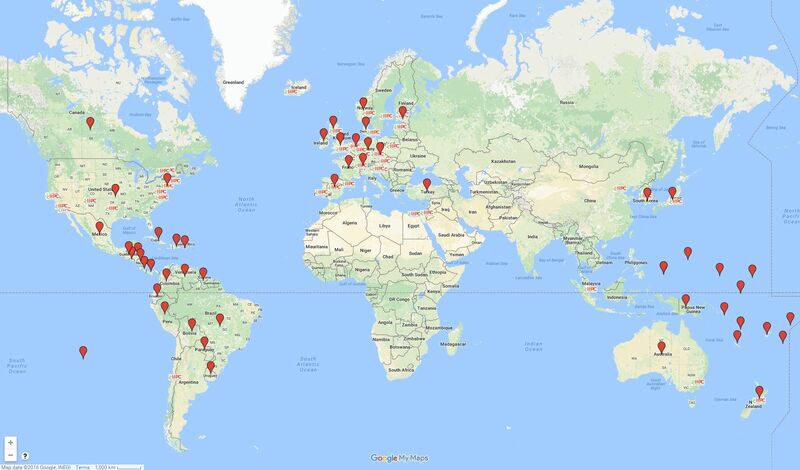 As you can see from our map we still have large parts of the world that aren’t represented in the collection. Do you know of any Olympic or Paralympic websites from these countries? If you want to find out more about what’s involved in documenting Rio 2016, why not join our Twitter chat and help us archive Rio 2016? Audience: Librarians, Archivists, Sports Researchers and anyone with an interest in web archiving. What Olympic collections are available online or in libraries and museums? Are they physical or digital collections? Do you have a favourite go to collection that you like to use? What’s involved in selecting websites or web pages for the collection? What types of resources do researchers like to use most when researching sport? If you could only choose one resource what would it be? Questions and answers from the audience about the Rio 2016 Collection. Don’t forget to use the collection hashtag #Rio2016WA when answering the questions. So on your marks, get set, go! A map of the nominations so far. There are still some parts of the world not covered in this collection. However, all of the National Olympic and Paralympic Committees from around the world are archived in a separate collection.